“Where we’re going, we don’t need roads”. If you saw a large good-looking man with a duffel bag sprinting through Seattle’s Roosevelt neighborhood in desperate search of a car2go on a crisp morning in April, that was me. That the car wasn’t where it was supposed to be was just one in a comedy of errors I experienced over the course of two days as I tried and failed to travel car free in the Puget Sound region. Inconvenient transit schedules and my own ignorance led me to (brace yourself) rent a car to get to Bellingham. What follows is the tale of my great struggle and how we might prevent it from happening again. My intent was to visit friends in Bellingham on a Friday for a birthday party. I’ve recently become a bit of an Amtrak junkie, having used it to go to Vancouver, B.C. and Portland. The Cascades line stops at Bellingham, so I proposed riding it there and having one of my friends pick me up from the station. The return trip wouldn’t exactly have been convenient, leaving Bellingham at 8:30 the next morning, but they agreed. The problem started on Thursday night with the longest public meeting I’ve ever staffed in Port Orchard. We brought the Planning Commission and City Council to a joint session and poured over the draft Comprehensive Plan in detail. It was a productive, but we started at 7 p.m. and didn’t wrap up until 10. Living car-free, that didn’t leave me many options for getting back to Seattle for the night. The foot ferry to Bremerton had stopped running long before. Fortunately, my boss was kind enough to give me a ride despite his commute back to Tacoma. Unfortunately, it wasn’t in time for the 10:30 ferry to Seattle. The last run of the night is 11:40. I found solace in music and the latest copy of Planning magazine. Once on the ferry I assessed my options for getting home to the University District. I wasn’t going to arrive until 12:40, when none of my bus routes were running anymore. When I checked car2go, the expensive option, there were none parked anywhere near downtown, and I wasn’t really in the mood to get a ride from a stranger with Lyft. But at the last minute a car2go vehicle did appear near the downtown library. I trudged uphill on empty streets to 6th Avenue and finally made it home around 1:30 a.m.
My train was scheduled to depart King Street at 7:45 a.m., so I planned to wake at 6. At least I’d get a few hours of sleep. But I was exhausted, so I slept through the alarm and awoke in a panic around 6:45. I skipped breakfast and hastily checked OneBusAway; the next 70-series bus wasn’t due for another 20 minutes. I flipped back to the car2go app and found one parked somewhat far away, in Roosevelt, but decided that driving was probably my best bet. I had no idea where I was going to park it, but it didn’t matter at that point. I grabbed my bags and made a run for it. Have you ever tried running wearing a rain jacket and carrying a backpack and duffel? It’s exhausting, but somehow I managed to avoid killing myself through exhaustion or jaywalking. And then, on my way, I faced another dilemma: I saw a bus approach. The route 66 was pulling up to a stop across the street from me. I knew that bus went downtown, but I wasn’t exactly sure where it stopped. I had no idea if it would get me near the train station. So I kept going. But the car wasn’t there. I checked my phone and I was standing right where the car2go app said I should be. I scouted the area to no avail. It was at this point, dripping with sweat and cursing my bad luck, that a wave of relief washed over me. I wasn’t going to make the train, and I realized that was alright. I began texting my friend to tell him I wasn’t going to make the party when I considered I had another option. I told him I was going to make it a little later than planned. I went home, had an actual breakfast, showered, and reserved a car through a Budget lot only four blocks from my apartment. I also managed to cancel my Amtrak reservation and get most of it refunded. Properly refreshed, I arrived at the Budget office only to discover I was required to rent with a credit card. I walked two blocks to the Enterprise office, where the first thing I asked was if I could use a debit card. I could, and the under-25 surcharge was much cheaper than what Budget’s would have been: the reservation totaled about $80 for 24 hours, plus a tank of gas, but considering my situation and the distance I was traveling the price was reasonable. After all of that, my trip went well. I ended up being really happy that I rented a car, as I got to explore much more of the Bellingham area than I would have otherwise. I drove up scenic Chuckanut Drive, checked out multiple city parks, visited Mt. Baker, and stopped by the beautiful beach on Birch Bay. 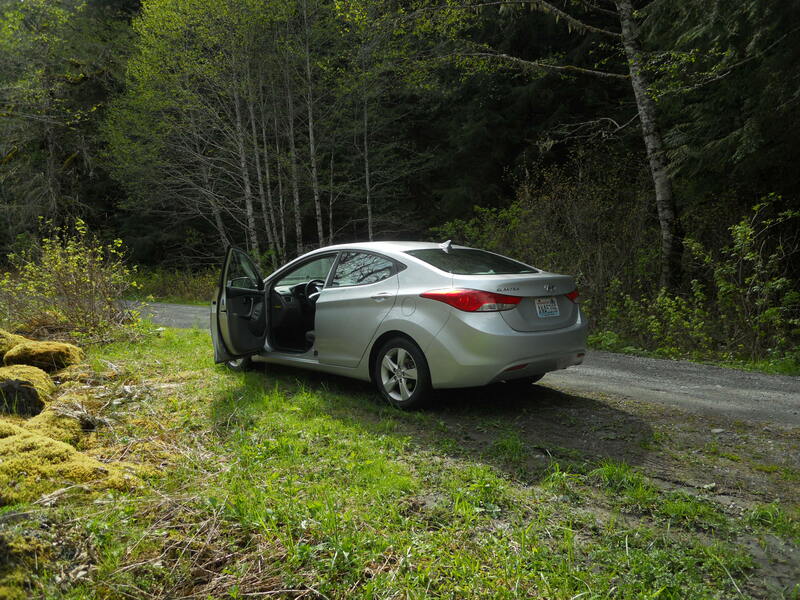 I also went a little off-roading, which a Hyundai Elantra is absolutely not equipped to do. Had I gone by train I wouldn’t have been able to experience any of that. And after a night of partying I was able to leave on my own schedule without waking up my friend at 7 in the morning. 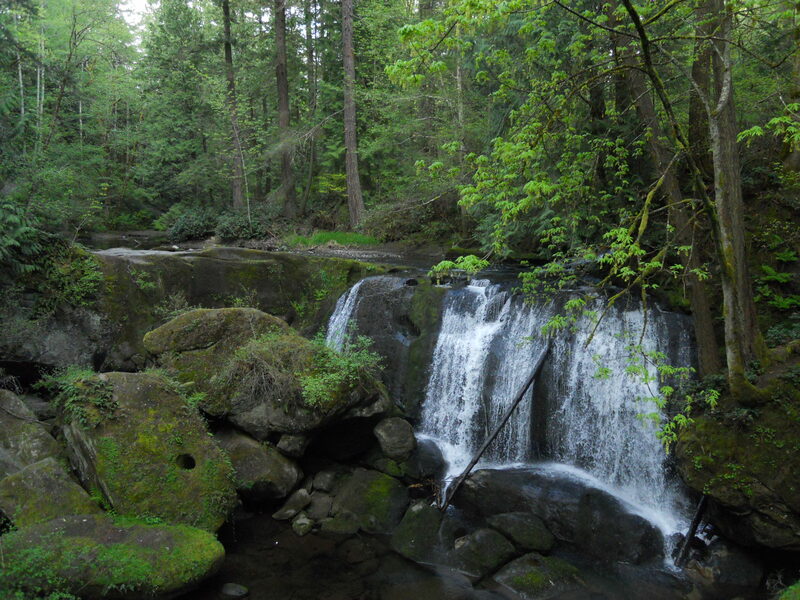 Whatcom Falls Parks, one of several Bellingham parks I visited. That said, there are a number of factors that could improve the feasibility of this kind of transit trip that goes beyond a single metropolitan area. The fact that it would have been possible speaks to the excellent public transportation options in western Washington, but for all their worth they are poorly coordinated and connected. Amtrak Cascades schedules are limited, with only two daily departures in each direction from Seattle. Northbound, the departures are at 7:45 a.m. and 6:50 p.m. There’s not much flexibility in there. A clear option would be a midday trip, but that is actually covered by a bus option that Amtrak offers at 12:25 p.m. Indeed, I should have been more open to the bus options. Greyhound also operates four daily bus trips between Seattle and Bellingham, and BoltBus operates five. I’ve been so steadfast on taking trains that I tend to ignore long distance buses, a symptom of the alleged societal preference for trains over buses. But part of my problem is also a knowledge gap, as I didn’t know the other options were there even though I have taken Greyhound before. It just didn’t come to mind. Amtrak might do well to partner with bus companies for advertising and to expand its intercity schedule outside of its limited train trips. Regardless, I would have had to get back to Seattle somehow. And I can’t really blame Washington State Ferries for its sparse late night sailings; it’s simply not economical to run empty ferries frequently, and at some point during the night both boats on the run need to tie up in Bremerton for the morning commute. Perhaps the lesson here is that the ferry terminals could have more amenities and a greater focus on transit-oriented development. As it was, I sat in an empty, creepy terminal for over an hour and the bland interior design left much to be desired. A coffee shop, lounge, or something else would make that kind of wait much more comfortable. In the long term, communities should focus more commercial and residential development directly adjacent to the ferry terminals to ensure they are lively and well used areas throughout the day. Of course, I had to get to the ferry terminal by car because the foot ferry stopped running at 8:30 p.m. Kitsap Transit could alleviate this huge gap in service by either expanding service later into the night or providing an alternative express bus between the downtowns of Port Orchard and Bremerton when the foot ferry doesn’t run on nights and Sundays. With a smaller vehicle and just one operator, rather than two crew members, such a service may be cheaper to provide even if the bus ride would be longer. For weekend nights, the service would make the most sense between 8:00 p.m. and midnight. It could be as infrequent as hourly or less, timed to meet the Seattle ferries. Kitsap Transit could also partner with a taxi company to provide discounted rides, especially for the last departing ferry (11:40 p.m.) and last arriving ferry (1:50 a.m.). In both instances that I relied on car2go I felt disappointed. The vehicles predictably follow commute patterns and are rarely available in downtown Seattle after business hours. I was lucky to find one as my ferry got into Seattle after midnight, though I had to walk some distance to it. One might argue for more car2go vehicles, which has been approved, but it might simply result in induced demand and not necessarily greater supply. An obvious solution here is that I should have been more open to using Lyft. King County Metro could also extend its infrequent night service to at least 2 a.m. when nightlife dies down. And then there was the missing car2go vehicle the next morning, after I slept in. I may not have actually made it in time, but the fact that the car was not where the app said it was is inexcusable and doesn’t need to be elaborated upon. Whether a technical glitch or someone snagged the car seconds before I reserved it from home remains unknown. At the same time, I should have caught that 66 bus that happened to come by. I now know it would have stopped as close as four blocks from King Street Station. Transit systems can’t be expected to facilitate such spontaneous trip decisions without a huge effort in public education, but a simple solution would to be specify the route terminus on the exterior bus display. Instead of saying that the trip is simply going to “Downtown”, it should note that its last stop is “3rd Avenue and Washington Street”. The terminus can be secondary and displayed only briefly. Intercity transit in the Pacific Northwest is fairly robust but could use some greater coordination between the various modes. Better advertising of service availability would also go a long ways toward helping people string together disparate trips. Transit services need to evolve beyond the commute, which makes up only about 1 in 5 of Americans’ trips, and seek to serve people frequently all day, all week, and for all types of trips. This entry was posted in Buses, Cars, Ferries, Rail, Transportation and tagged Amtrak, app, Bellingham, BoltBus, Bremerton, car rental, car2go, Cascades, cost, fare, ferry, foot ferry, Greyhound, King County Metro, Kitsap Transit, Planning, problem, route, scheduling, Seattle, smartphone, time, transit, transportation, trip, trip planning, Washington State Ferries. Bookmark the permalink. Stay car free! Nice blog! Do you use the 30-minute reserve feature on Car2Go? I find it really helps ensure the car you want is there and waiting. I’ve never reserved and had it be gone. And I totally agree with buses not being thought of as easily as trains. They are useful because during peak days or times, adding a bus is easy for the company. I take the train to Portland a lot. but when Amtrak runs their bus, it’s always better to choose BoltBus.